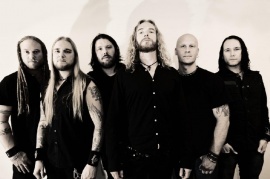 Dark Tranquillity is a Swedish melodic death metal band from Gothenburg. They are one of the longest-standing bands from the original Gothenburg metal scene, and are one of the most integral pioneers of the melodic death metal genre of music. Dark Tranquillity was formed in 1989 by vocalist and guitarist Mikael Stanne and guitarist Niklas Sundin, who looked at their influences and then decided to form their own band under the name Septic Broiler. Not long after, three additional members, Anders Fridén, Anders Jivarp and Martin Henriksson, joined the line-up. In 1990, the band recorded a demo cassette tape entitled Enfeebled Earth before they would change their name to Dark Tranquillity and change their musical style. It was followed by multiple demos, and in 1993, Skydancer was released. Soon after, Fridén, Dark Tranquillitys main vocalist at the time, left the band and later joined In Flames. Stanne then became the lead vocalist, and Fredrik Johansson was recruited to take over rhythm guitar duties. In 1995, the second full length album The Gallery was released, often referred to as the masterpiece of the era. The release saw a change in the bands style, but kept the characteristics essential in the bands melodic death metal sound, such as growled vocals, abstract riffing, acoustic passages, and a female guest vocalist. The third album, The Minds I, was released in 1997. Projector was released in late 1998. It was the fourth album from the band, and was later nominated for a Swedish Grammy Award. The album saw a major change in songwriting: while retaining growled vocals and their signature death metal sound, pianos, baritone soft vocals, and verse-chorus fashion song structures were now integral parts of Dark Tranquillitys sound, reflecting the bands goal to strive for different musical expressions. After the recording of Projector, Johansson was asked to leave as he started to lack devotion to the band, stemming from being a parent and keeping a day job. A year later saw the release of Haven, which introduced the addition of electric keyboard sounds, but also saw the abandonment of the newly adopted clean vocals in favor of an overall heavier sound. By this time, Martin Brändström had joined for keyboard duties, and Michael Nicklasson had replaced Henriksson on bass, with Henriksson becoming the bands second guitarist. During their 2001 tour the band hired Robin Engström to play live because Jivarp became a father. Dark Tranquillity released Damage Done in 2002, and was intended to be a step in a much heavier direction, adding thicker guitar distortion, deep atmospheric keyboards, and abandoning soft vocals altogether. They released the music video for the single "Monochromatic Stains", followed by their release of Live Damage, their first live DVD. Character was the seventh release from Dark Tranquillity, released in 2005, and was held in much critical praise. It featured the third music video released by Dark Tranquillity, with the successful single "Lost to Apathy". In 2007, Fiction was released, which in turn, saw a return of Stannes clean vocals, and the first female guest vocalist since Projector. The album also saw writing style that combined the stylings of Projector and Haven, with the more aggressive traits of Character and Damage Done. At this time, Dark Tranquillity toured with The Haunted, Into Eternity, and Scar Symmetry for the North America Metal for the Masses Tour. They also toured the UK in early 2008 along with Omnium Gatherum. They returned to the US during spring 2008 with Arch Enemy. On the bands official website they announced that bass guitarist Niklasson left the band in August 2008 due to personal reasons with no hard feelings between him and the band. On September 19, 2008, the band found a new bassist in Dimension Zero guitarist Daniel Antonsson, who also was a guitarist for Soilwork. On May 25, 2009, reissues of Projector, Haven, and Damage Done were released. On October 14, 2009, Dark Tranquillity finished work on their ninth studio album. On October 26, 2009 they released a DVD titled Where Death Is Most Alive. On October 30, 2009 at the release party of the DVD 333 copies were given away for free of the rare live album The Dying Fragments. On December 21, 2009, Dark Tranquillity released the song "Dream Oblivion" and on January 14, 2010, they released the song "At the Point of Ignition" from their ninth album, exclusively on their MySpace page. Their ninth album, titled We Are the Void, was released on March 1, 2010 in Europe, and March 2, 2010 in the US. They were also the opening act for a US winter tour that was headlined by Killswitch Engage and joined by The Devil Wears Prada. Dark Tranquillity announced a headline tour in summer 2010 with Threat Signal, Mutiny Within and The Absence. In February 2011, the band performed live at BITS Pilani Hyderabad Campus in Hyderabad, India. Register now your email address and never miss events, dates and news for DARK TRANQUILLITY.